a. – Tu-wis-kaw (-----); a young bridegroom, Connibo, giving his bride, not a “drive,” but a daily ride, on the pampa del Sacramento. 1853. 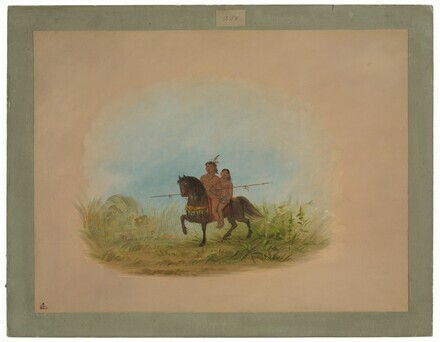 Sudamerica: Pinturas de George Catlin, Museo Franz Meyer, Mexico City; Museo Nacional de Bellas Artes, Buenos Aires; Museo Chileno de Arte Precolombino, Santiago, Chile, 1989-1990, no. 10, color repro. (organized by United States Information Agency). American Paintings: An Illustrated Catalogue. National Gallery of Art, Washington, 1992: 108, repro.